Note: The cake is vegan but not the frosting. Use necessary substitutes to make the frosting vegan too. 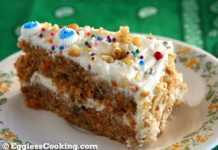 Or check out here for vegan cream cheese frosting recipe. My son got lucky this year and I baked 2 cakes for his birthday. The first one was this fabulous egg free 6 layered rainbow cake and the second was this gorgeous vegan beet chocolate cake. 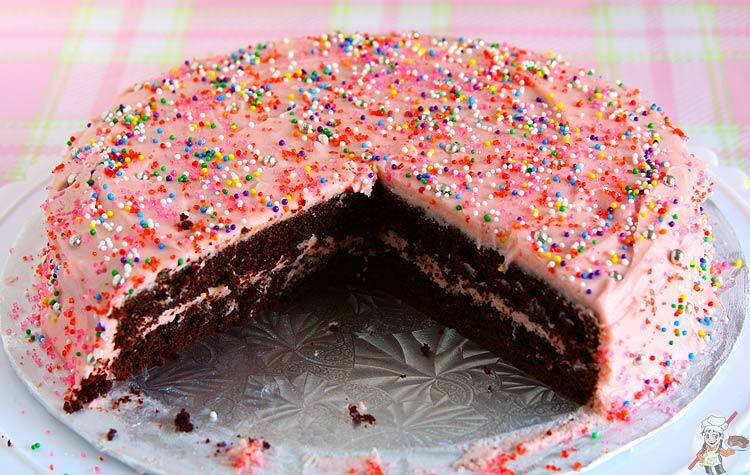 Yes, I agree this cake looks girly with a pink frosting but who cares, when it tastes and looks this good! I had two cans of beets sitting for quite some time now and was looking for ways to use it up. I already have a beet brownies recipe and a gluten-free beet chocolate cake here. That’s when I remembered having bookmarked a beet chocolate cake recipe on my favorite website, Taste of Home. For some reason was not too excited about that recipe and started looking for recipes on Pinterest and that’s when I stumbled on this one and few others but decided to go with the former because it was vegan, to begin with. But I did make a couple of alterations as usual! 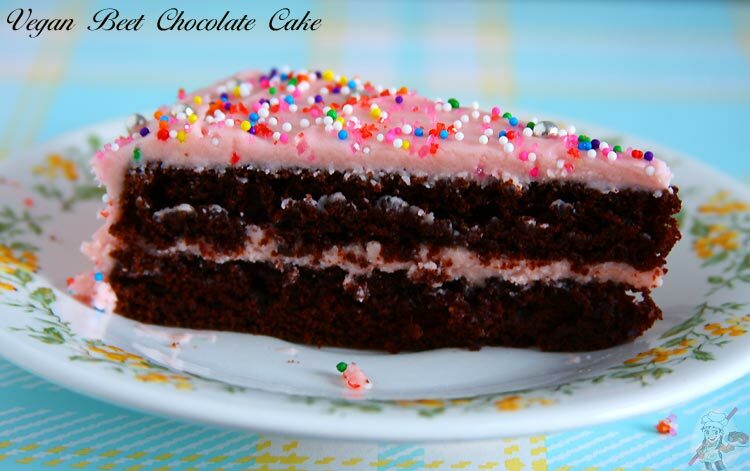 While looking for the cake recipe also saw a few recipes for pink colour frosting using beet puree and this one caught my attention. I wish I got that dark pink hue as well, but this baby pink one looked good too. The cake was super moist and fudgy. It didn’t taste anything like beets. The same with icing too! I promise that no one will be able to tell that it’s a vegan and that too a beet chocolate cake unless you tell them. You may even have to promise them that it’s beets that they are eating! In another bowl combine together all the wet ingredients and gradually stir it into the dry mix using a whisk. Do not over mix. If you think that the batter is too thick add some more water/milk as needed. Fill the prepared pans with enough batter and bake accordingly. I used the batter to make 6 cupcakes and two 9-inch round cakes. Baked the cupcakes for 15 minutes and cakes for 23 mins in a preheated oven at 350F/180C. In a large bowl beat the cream cheese until it’s smooth and creamy. Then add the butter and beat it for another minute or two until it’s well incorporated. Add in a cup of sugar, beet puree, vanilla extract and lemon juice and beat well scraping the sides. Add enough sugar as needed and milk/water as needed and keep beating until the desired consistency is reached. 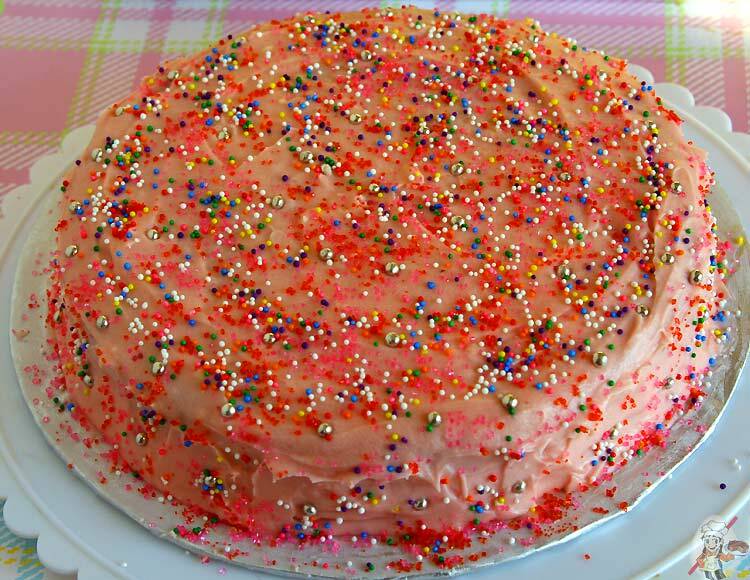 Refrigerate the frosting for about 30 minutes before you can start frosting the cake. Frost the cake as usual by leveling off the cakes and filling the frosting in between the two cakes and covering it up with the frosting. Decorate it as you wish. Line the round cake pans with parchment paper so that you can remove the cakes from the oven with ease. 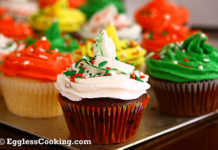 It will just slide off and the wait time is short too, so that you can start the frosting quickly. I used canned beets instead of buying fresh ones and cooking it. It made the whole process pretty easy. I blended the beets and very little beet water to make a smooth puree. Reserved some of the water to include in the frosting as well. The original recipe used about 3/4ths of a cup of unsweetened applesauce which I didn’t have so replaced that with the beet puree as well. So I used 2 cans of beets in total. I think it was two 380oz cans. 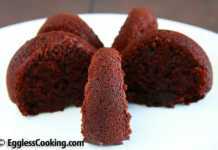 This recipe can be made into a bundt cake or as a 3 layered cake if you don’t bake cupcakes. For vegan cream cheese frosting using Tofutti and Earth Balance instead of cream cheese and butter. I had only 2 tablespoons of puree left over from adding to the cake batter. 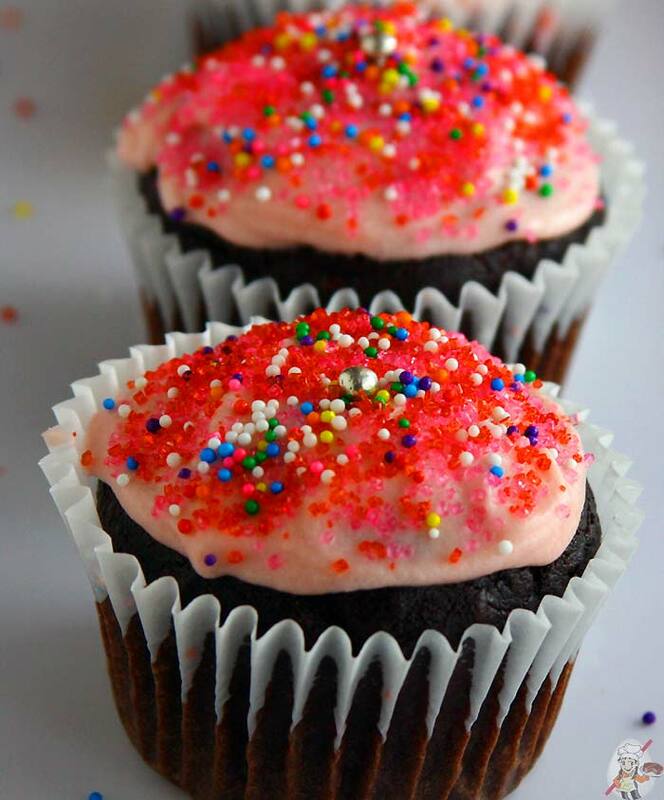 A little more would have given an even brighter pinker hue to the frosting. I amended the recipe by half using less sugar (3/4 cup raw cane sugar), different flour (used oat), more beet puree (freshly made from beets), less oil (Safflower) and a lot of homemade applesauce (as an oil replacement). It needed to bake longer. For frosting, I made my own with cocoa, coconut oil, raw honey (not vegan – can use agave instead), and peppermint extract and powdered sugar. I had to bake it much longer at 375 (40 minutes) and then let it cool in the oven (off). It came out very moist. That’s amazing Beth! Thanks for sharing.